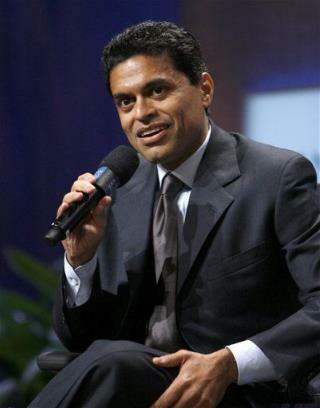 (Newser) – In the wake of Fareed Zakaria's plagiarism confession, the Washington Post points out another attribution problem with the journalist's work: In his 2008 book The Post-American World, Zakaria uses a quote from former Intel CEO Andy Grove that originally appeared in another book from 2005, Three Billion New Capitalists: The Great Shift of Power to the East by Clyde V. Prestowitz, a former Commerce Department official. Zakaria did not source the quote in the 2008 edition or a 2009 paperback version of his book, despite the fact that Prestowitz contacted Zakaria about it. When you're in a hole Fareed, best to stop digging. Apologise, give credit (careful, genuine, accurate credit) and move on. And don't do it again! And again. Let's see: Minority? Check. Liberal? Check. Anti-American? Check. Nope, nothing to see here, move along now. this loud democrat cheater as usual! most people who whine only because they busy not working hard!